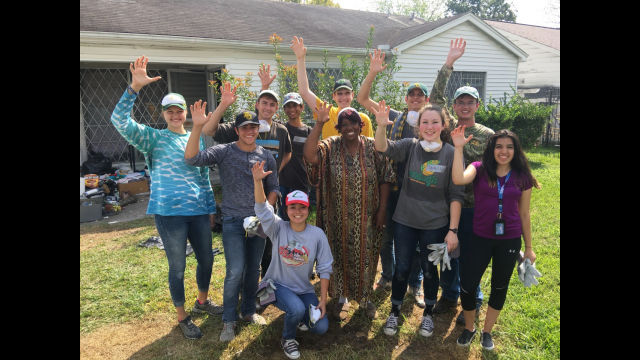 WACO, Texas (Feb. 9, 2018) – Teams of Baylor University students, faculty and staff will partner with various community groups and relief efforts over spring break March 4-9 in order to bring hope to communities that were impacted by Hurricane Harvey. Baylor Missions will work to identify needs, serve others and bring relief to the recently devastated and desolate areas in south Texas and along the Texas Gulf coast. Two teams will be serving in Harvey-related efforts during spring break. One team of 11 students will be going to Rockport, on the Gulf coast, through a partnership with the Texas Hunger Initiative, where they will focus their efforts on food insecurity and disaster relief. 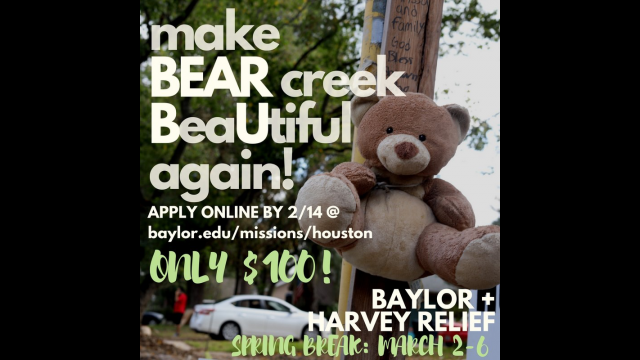 Baylor Missions’ second team, “Make BEAR Creek BeaUtiful Again,” has “adopted” a community outside of Houston called Bear Creek. The group is still looking for participants and the deadline to register has been extended until Feb. 14. The team was created as a response to “Change the World in a Day” through Baylor Chapel and Baylor Missions. 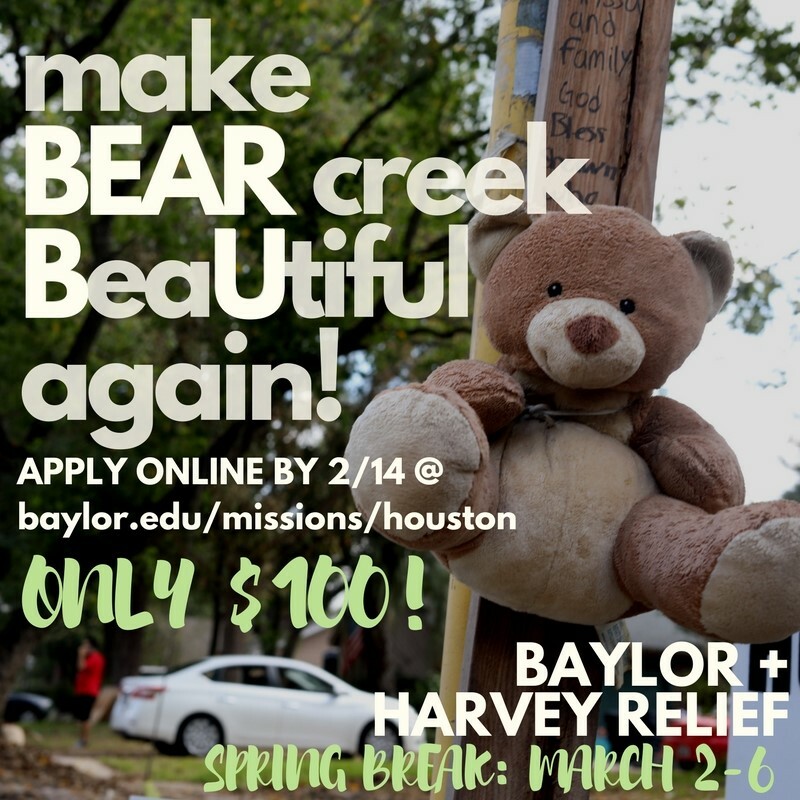 Because of gifts from donors, alumni, friends of Baylor and from the sale of Baylor Christmas ornaments, the cost to join the Bear Creek trip is only $100. 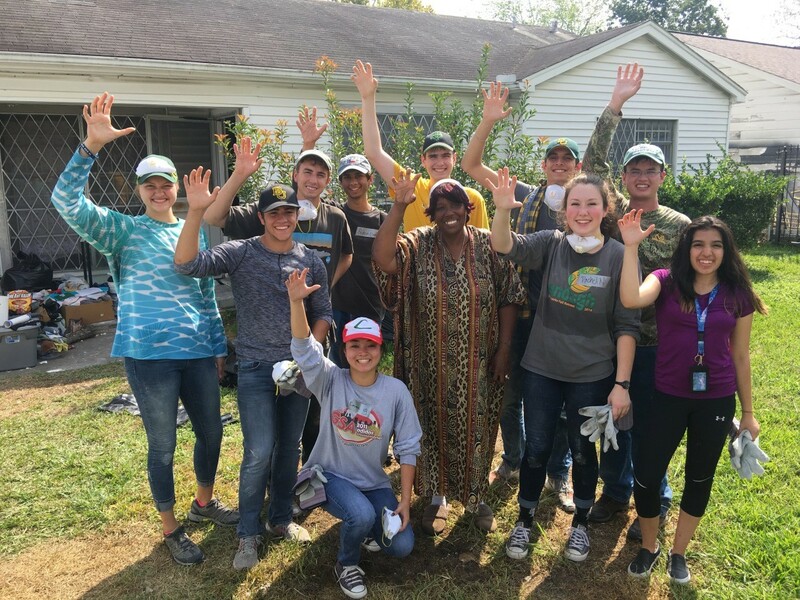 During the fall and winter breaks, nearly 90 Baylor students have volunteered their time and energy to help with debris clearing and home rebuilding at 17 work sites across four different areas around Houston. The community partner with the Bear Creek trip, Penny Moore, spoke at Baylor Chapel on Jan. 24 to bring awareness to students about the continued relief efforts in her community. As a result, students in Chapel raised more than $10,000 toward Harvey-related efforts. For more information and to apply, visit the Baylor Missions website.